Let's keep it simple. 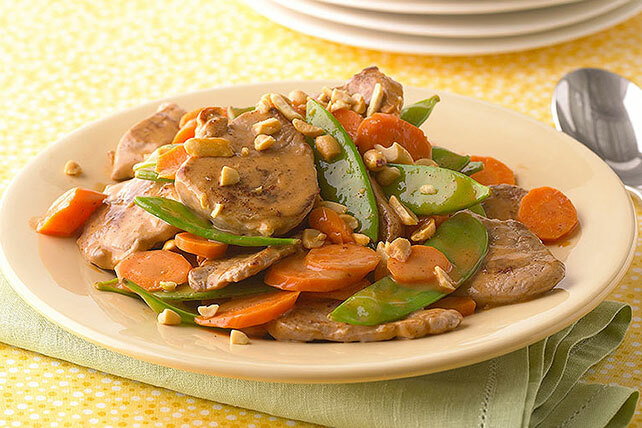 Thinly sliced pork, carrots and snow peas in a sesame-BBQ sauce. Pretty cool for such an easy recipe! Heat large nonstick skillet sprayed with cooking spray on medium-high heat. Add pork and carrots; cook 5 min., stirring occasionally. Stir in dressing and barbecue sauce; stir-fry 5 min. on medium heat or until carrots are crisp-tender. Add snow peas; cook 2 min. Top with peanuts. To make this a meal, serve this stir-fry over hot rice or noodles.